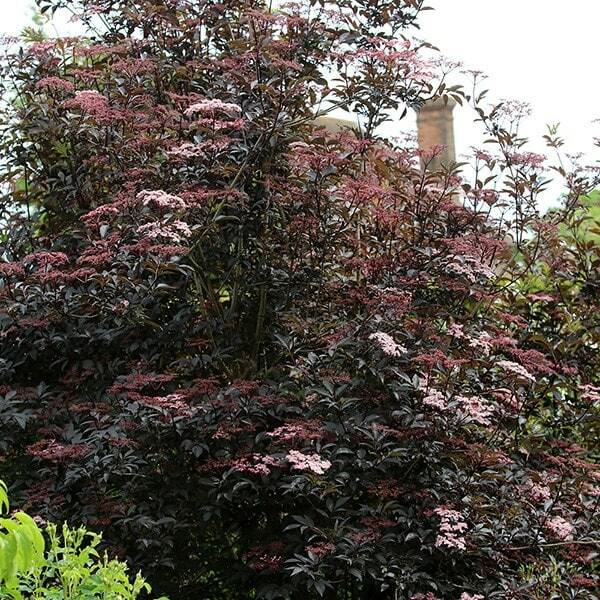 This fantastic new variety of elder has intense, black burgundy foliage and sweet, lemon scented, pale pink flowers in early summer, opening from dark red buds. Darker than other varieties it makes an excellent ornamental plant for a site in sun or partial shade. As an added bonus the purple black autumn fruits are highly attractive to songbirds. For best foliage colour grow it in full sun, otherwise it can fade to a greenish-bronze. Your plants are always healthy and nicely packed. Would this lovely plant grow well in the Alpes Maritimes or does it need a much richer and moister soil than I have down here in the South? Hello there Sambucus nigra f. porphyrophylla 'Gerda' does need a fertile, humus-rich, moist, well-drained soil but unfortunately I cannot say if it will grow well outside the UK. Sorry I cannot help you more. Hi, Is this plant evergreen? Hello, No, this is a deciduous shrub that loses all its leaves during the winter. would this be suitable as a screening plant in a west facing very windy exposed position? Hello, If you cut this shrub back each year, then it is possible to keep it more compact, but if you leave it un-pruned it does get big. I would not say they develop a tree-like habit though as they are multi-stemmed. 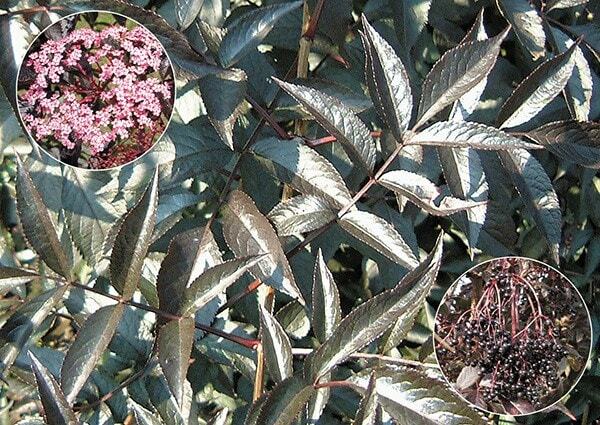 Hi, can a sambucus be planted into a tub and if so what size tub should I use? Many thanks. My Sambucus nigra is planted underneath a flowering cherry tree. The canopy is reduced after the tree has flowered each year. I have cut down the Sambucus to ground level in the Spring. The plant is in it's 4th season and hasn't flowered since it's first season. All that I have is rapid untidy growth. The site is south facing and well drained. Am I onto a loser here or is there something I can do to make it flower? I bought one a couple of years ago - last summer it started off well but then suddenly (within a very short space of time) every single leaf dried up and fell off. There was also evidence of brownish mottling on the leaves (originally I thought bugs had been chewing on the underside of the leaves!). If it's relevant, last summer was jolly wet. Now it's spring again, the plant made very small shoots and I hoped it was going to recover - these shoots have been very slow to mature and a close inspection doesn't bode well. The shrub is located in a pot on a South facing garden in the West of England - it's one of my favourites, but I don't know what went wrong or whether to bother getting a new one. I'd hate to loose another. I thought these were supposed to be pretty tough plants. Any idea what might have gone wrong? Hello, These plants are generally quite tough, but they are prone to a soil-borne fungal disease called Verticillium Wilt. I'm afraid there is no cure for this, so if you think this might be the cause, then you should remove the plant with as much of the rootball and surrounding soil as possible. You should also take care not to spread this soil to other areas of the garden. Once the plant is removed, you can then re-plant with something that is resistant to this disease. This includes all the conifers and grasses, as well as Cercidiphyllum, Crataegus, Gleditsia, Betula, Eucalyptus, Liquidamber, Morus and Salix spp.